Our articles about recently released books are good resources for readers interested in Laura Ingalls Wilder and Little House on the Prairie. Here is a brief overview of A Prairie Girl’s Faith: The Spiritual Legacy of Laura Ingalls Wilder. The beloved author of the Little House books was not only one of America’s great pioneer storytellers but a woman of vibrant faith. A Prairie Girl’s Faith provides the first extended, in-depth discussion of the Christian faith of one of America’s most beloved pioneer women–Laura Ingalls Wilder. Although the faith of the Ingalls’ family pervades books in the Little House series, the more specific details of Laura’s faith have never been fully explored. It took extraordinary courage for anyone to survive the harshness of frontier life — from the heartbreak of sudden crop losses to dangerous storms to unrelenting loneliness. This book reveals how in surviving, the brave Laura drew not just on her character, but found encouragement, strength, and hope in her relationship with God. In the last twenty-four years, Stephen Hines has published seventeen books with over 600,000 copies in print. Using his skills as a literary prospector, Hines has researched and developed four bestsellers: Little House in the Ozarks (1991), I Remember Laura (1994), The Quiet Little Woman: A Christmas Story (1999), and Laura Ingalls Wilder, Farm Journalist: Writings from the Ozarks (2007). Little House in the Ozarks was a Publishers Weekly bestseller and The Quiet Little Woman landed on the USA Today gift book list. Hines spends his time in magazine and reference archives, on the Internet, and in university libraries to make his discoveries. His Ozarks book republished over 140 forgotten columns of the famous children’s author Laura Ingalls Wilder. It was the first time these columns had been published in book form. It was also a major Christian Booksellers Association title, though most of the sales were in regular trade stores. The Quiet Little Woman was a significant success for Honor Books. These Christmas stories by Louisa May Alcott reintroduced the nineteenth century’s most popular writer for children to a whole new generation of readers and have led to the publication of two more books: Kate’s Choice (2001) and Louisa May Alcott’s Christmas Treasury (2002). A release for 2006, Writings to Young Women From Laura Ingalls Wilder helped to revive interest in Mrs. Wilder’s biography from those years that followed her childhood as she continued to pioneer on the Ozark hill farm she shared with husband Almanzo and daughter Rose. This three-book series honored Mrs. Wilder’s birth 140 years earlier (in 1867) in Pepin, Wisconsin. The University of Missouri release in 2007 of Laura Ingalls Wilder, Farm Journalist: Writings from the Ozarks collected all of Mrs. Wilder’s writings for the old Missouri Ruralist farm paper and published them just as they originally appeared between 1911 and 1925. Hines’s eighteenth book was released September 1, 2011: Titanic: One Newspaper, Seven Days, and the Truth That Shocked the World. The work memorialized the 100th anniversary of the sinking of RMS Titanic on the night of April 14/15, 1912. As a graduate student at Ball State University in Muncie, Indiana, Hines started his career by editing and writing for the Indiana Oral History Newsletter. After graduation, Hines moved to Asheville, North Carolina, to work as a copy editor for The Presbyterian Journal, now called World magazine. From Asheville, Hines and his family moved to Nashville, Tennessee, to work for Thomas Nelson Publishers where he eventually became managing editor. After several years at Thomas Nelson, he went to work as editor for Wolgemuth Hyatt, Publishers, and then went to M. Lee Smith Publishers. Now he writes and edits from his home. Hines and his family live near Nashville. His hobbies include compulsive reading, competitive running, and songwriting. From 2001 to 2003 he was founding Director of Communications for the Tennessee Department of Children’s Services. A website, LiteraryProspector.Com, gives would-be writers advice and ideas on how to get started in publishing and relates the latest information on his Titanic book. His poetry has appeared in The Tennessean, The Nashville Scene, InReview, and Hills & Hamlets. He currently writes a column for The Nolensville Dispatch. 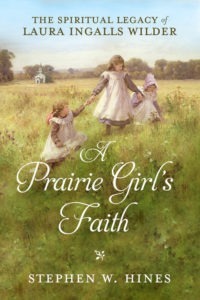 Pick up your own copy of A Prairie Girl’s Faith: The Spiritual Legacy of Laura Ingalls Wilder here. Check out our Recommended Reading for Adults and Recommended Reading for Children & Young Adults for more great books and be sure to subscribe to our newsletter for information and recommendations about interesting reading and activities.